By Jake Rocheleau in UI/UX. Updated on November 3, 2017 . It’s so easy to create sleek websites with Bootstrap, even if you have zero design knowledge. The library is easy to set up and works right out of the box with a pristine design. But, when too many sites have the same Bootstrap style, you get far too many pages that look identical. However, you can make your site stand out with frameworks such as Bootplus. This free BootStrap framework restyles all the CSS for a refreshed Bootstrap look. This makes your default layout look more like a Google+ page with similar buttons, text, grids, and live components. Read Also: Are Ready-made Websites Killing Web Design? Note this framework is 100% free just like Bootstrap. So, it’s an excellent choice for developers who don’t want to spend money and prefer open-source. It also works with the FontAwesome library which is Bootstrap’s icon font of choice. 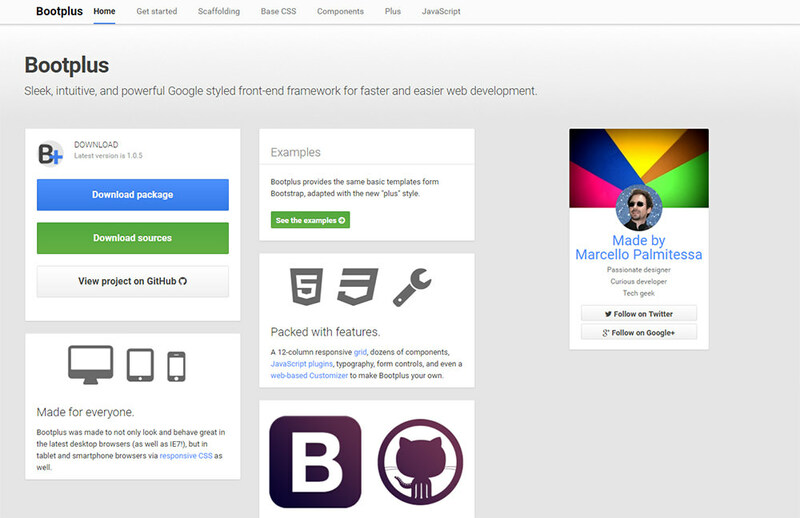 The Bootplus homepage is set up much like Bootstrap’s, so you should have no trouble working through the documentation. There’s a handy guide on the Getting started page which should help anyone download & install this framework. Note if you’re looking to customize this with your own CSS you’ll need to know LESS or be willing to edit the raw CSS. Bootstrap also uses LESS, so this keeps everything consistent. Although, it was announced that Bootstrap 4 will be switching to Sass and this may affect the Bootplus framework, too. As of this writing, Bootplus works with all Bootstrap v3.x releases and should support the new Bootstrap 4, once it’s released publicly. If you loathe the boring default Bootstrap styles then you’ll absolutely adore Bootplus. It’s really easy to set up and you can find all the documentation you need right on the website. Of course, it also has a GitHub repo if you wanna check that out or browse through the code before downloading. Questions or suggestions can be sent to creator Marcello Palmitessa via his Twitter @marcellopalmit.